With our Passport to WINter Event, we want to give our customers a chance to get a break from the hard Saskatchewan winter. 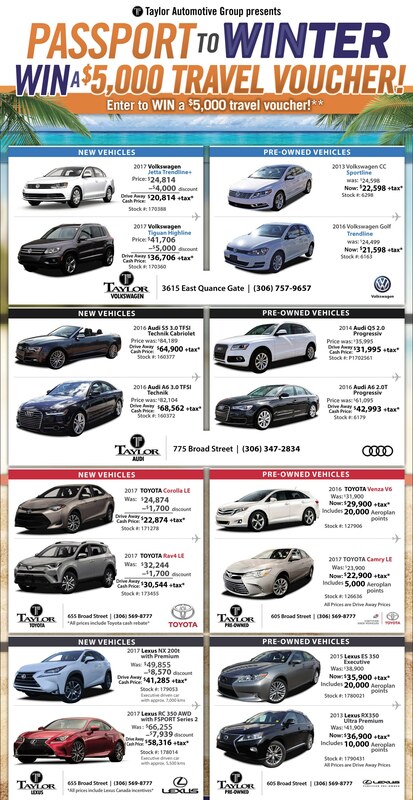 Taylor Auto Group wants the shopping experience to be excellent from start to finish. The cars are meticulously inspected and reconditioned. Our friendly staff is helpful and knowledgeable. We offer excellent value, excellent financing options, extended warranty and protection packages, not to mention the excellent shops that can keep your vehicle in excellent condition for years to come! And now, you get a chance to add Cuba, or Mexico, Hawaii, or wherever you see fit if you are the winner of this excellent travel voucher! Please see a Product Advisor for full details. In the meantime, check out these great deals, below. You can save THOUSANDS on some vehicles.